The total square footage of San Francisco tenants seeking space rose to 7.1 million square feet during the first quarter, surpassing the level of existing available supply by nearly 300,000 square feet, says CBRE. 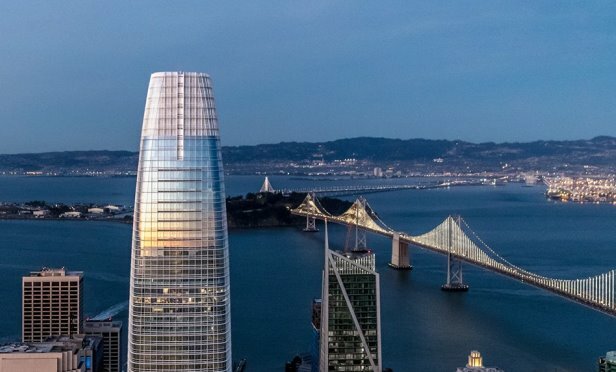 Salesforce Tower has no available large floorplates, like much of San Francisco’s space (credit: archpaper). SAN FRANCISCO—Frantic might be the word to accurately describe the market’s critical supply/demand imbalance as of today. The total square footage of tenants seeking space in the market rose to 7.1 million square feet during the first quarter, surpassing the level of existing available supply by nearly 300,000 square feet, according to CBRE research. Supply is especially limited for large blocks of 100,000-plus square feet. There are currently two such blocks available, but there are a mere 22 tenants in the market for this type of space, says CBRE. Moreover, this limited available space, rising demand from growing tech companies and a stalled supply pipeline continue to put upward pressure on asking lease rates, particularly for large blocks of space, further reducing vacancy to 3.6%. And indeed, rates have jumped 12.6% since the first quarter of last year. This rent growth will be felt across all size ranges and submarkets going forward in 2019. The market’s overall average asking lease rate surged 2.3% quarter-over-quarter to a new record-high of $82.88 per square feet in the first quarter, says the report. “Demand is stable for now as companies continue to want a foothold in San Francisco and the Bay Area, but they are increasingly concerned about cost and availability, both for real estate and for talent, which could inhibit some of the tremendous growth that has been accomplished during the past five years,” Russell tells GlobeSt.com. The Federal Reserve has signalled it will be pursuing a dovish monetary policy for the time being. This should be good news for REITs, but don’t be surprised if many view the development as merely a blip on a longer-term horizon.